(i) Jump first from – 6 eV level to – 10 eV level, emitting a 4 eV photon. (ii) Jump next from – 10 eV level to – 15 eV level, emitting a 5 eV photon. (iii) Jump directly from – 6 eV level to – 15 eV level, emitting a 9 eV photon. Therefore the excited gas will emit photons of energies 4 eV, 5 eV and 9 eV as given in option (d). (2) If the gaseous sample of atoms in the above question were irradiated with photons of two discreet energies 2 eV and 12 eV, what will be the energies of the photons emitted by the gas? Incident photons of energy 2 eV cannot be absorbed by the atoms since there is no energy level which is higher by 2 eV with respect to the ground level. But the incident photons of energy 12 eV can be absorbed by the atoms since there is the energy level of – 3 eV which is higher by 12 eV with respect to the ground level of energy – 15 eV. (i) Jump first from – 3 eV level to – 6 eV level, emitting a 3 eV photon. (ii) Jump next from – 6 eV level to – 10 eV level, emitting a 4 eV photon. (iv) The atom (actually the electron in the atom) can jump from – 3 eV level to – 10 eV level, emitting a 7 eV photon. 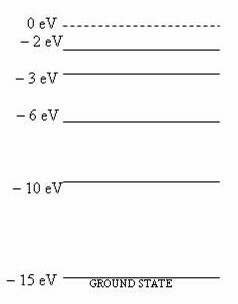 (v) The atom, after reaching – 6 eV level [as given in (i)] can jump directly to – 15 eV level, emitting a 9 eV photon. (vi) The atom can jump directly from – 3 eV level to – 15 eV level, emitting a 12 eV photon. Therefore the excited gas will emit photons of energies 3 eV, 4 eV, 5 eV, 7 eV, 9 eV, and 12 eV as given in option (c). The correct option is (c). In an electron microscope electron beam is used (similar to light beam in optical microscope) because of the wave property of electrons. The wave length of electron at a few hundred volts of accelerating voltage is of the order of X-ray wave length so that much greater resolution and magnification compared to optical microscope is possible. (4) In a hydrogen atom in the ground state suppose the orbital speed of the electron is ‘v’. If the mass of the electron is ‘m’ and the magnitude of its charge is ‘e’, what is the radius of the orbit of the electron? mv2/r = (1/4πε0) (e2/r2) where ε0 is the permittivity of free space.